"How do I become rich?" Figure out your own gift. What tools have been given to you at birth and make you as unique as your own finger prints? Once you know what tools you're working with, sharpen them and make use of them to create things and become an expert at being your best self. Enable others to benefit from your gift, share what you have to offer with people around you. This is not only a good way to generate good karma and but it helps improve yourself so that you can become phenomenal. 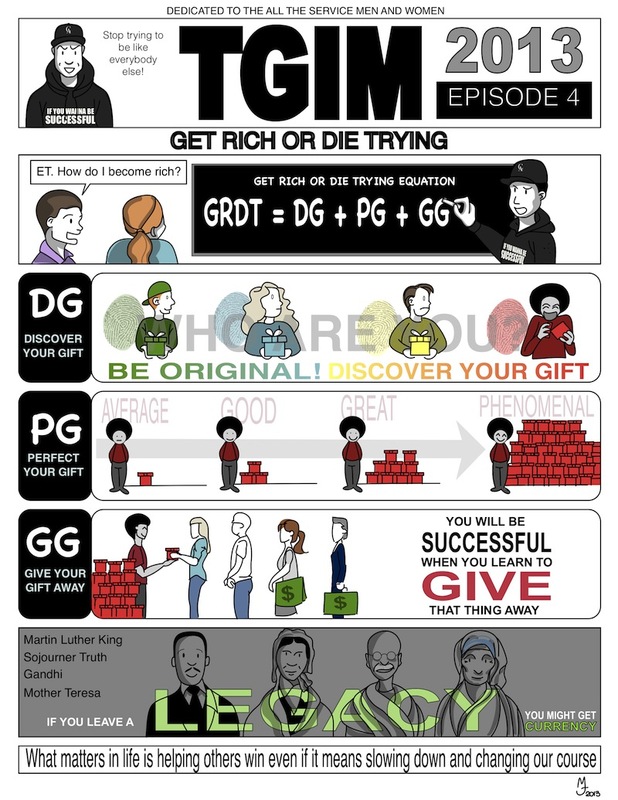 This is ET's fail-safe formula to not only become rich but to also leave a legacy, like all the people who reached the phenomenal state before us. I really think that everyone who has the chance to live on earth has a mission to discover their unique gift (kinda like their own superpower ) and contribute to our evolution by making good use of their gift and sharing it with everyone around them. I also think that you discover what your gift is not only by questioning yourself, but also by taking action. Try different things and evaluate how you feel doing them. Another trick you can use to figure out what your gift is, is to go back and think of what you use to love to do as a kid for hours on end. In my case it's drawing. I used to draw all the time when I was a kid and was really good at it. I remember that one time in preschool, our homework was to draw a summary from a picture book we read. I must have been 5 or 6. I still remember spending the evening drawing a loch ness monster next to a boat on the kitchen table. I was very proud of it. The next day, when my teacher saw the drawing I handed in, she told me that I shouldn't have my parents draw for me and gave me a zero because she considered it cheating. I was crushed and went back home crying. Thankfully, my mom (furious) contacted the teacher the next day to get this corrected. The teacher sent my mom an apology letter and corrected my grade but I never trusted or liked her after that incident. I think I still have the drawing and the letter somewhere... Anyway, I'm glad my mom took care of this. Another inspiring illustration MJ! Love the fact that you're doing these for each episode. And I completely agree that the only real way to discover your gift is to take action, and also take time to reflect - to question yourself and daily habits and progress. I've learned so much about myself by consistently writing and reflecting on my day, and more recently weeks and months. I think we tend to wait for that "perfect opportunity" or "perfect aha moment" all too often, instead of just going out there and putting our ideas to practice. But that's truly the only way to know - take action. And thanks for sharing your childhood story. I agree that schools need to be an enabler for students to discover (and experiment) with their talents. Having the standard English, Math, Science, etc. is important, but that doesn't mean it's more important than anything else either - have you seen any of Sir Ken Robinson's TEDTalks? He has some inspiring talks on the topic. Thanks Parin. Writing also works for me and I try to do it on a regular basis. Thanks for the quote. It's one of these things we almost need to constantly remind ourselves as it's easy to find many reasons to not take actions. The talk by Sir Ken Robinson is great. It's a real eye opener. You might like the video INGE DRUCKREY : TEACHING TO SEE. I think it's a great example of a teacher who I think gets it and took that under consideration while teaching.